For the past few years, anything red velvet has been extremely popular. At the same time, nutella has become a huge force on the culinary scene. So why not combine the two! These nutella stuffed red velvet cookies are amazingly rich and sweet and bursting with the latest trending flavors. While stuffing a cookie may seem complicated, you will be surprised at how easy it really is! 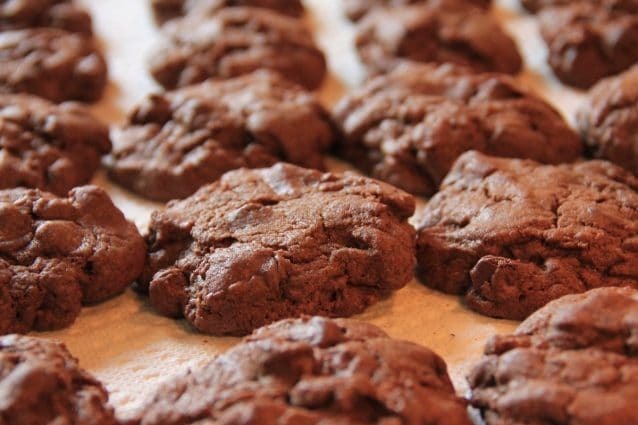 The simple use of a freezer and you will be packing your cookies full of nutella goodness. Once baked, these cookies keep at room temperature for about a week once baked but a little trick is to freeze the cookie dough balls before you bake them. Then, when you are ready for fresh, hot cookies, simply pull the cookie dough balls out of the freezer and bake them! This is an easy way to have fresh cookies anytime and, with the mouth watering flavors in these gooey red velvet nutella cookies, you are going to want fresh cookies all the time! Combine the brown sugar, granulated sugar and melted butter in the bowl of a mixer fitted with a paddle attachment. Mix on medium speed until the ingredients come together. Add the vanilla, egg and egg yolk to the mixer and again, on medium speed, mix until combined. Add the red food coloring to the bowl and mix. 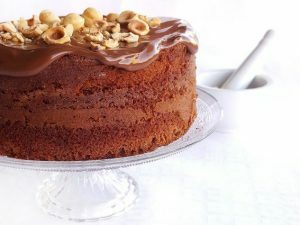 The batter should be a bright red color and have a very loose texture. Next, add the cocoa power, all purpose flour, salt and baking soda to the bowl and turn on low speed to mix until the batter has all come together. Scrape down the sides of the bowl and mix again to ensure all the ingredients are combined. Place the batter, still in the bowl, in the refrigerator and let cool for about 30 minutes to one hour or until the batter has thickened. After you place the batter in the fridge, scoop the nutella into small balls using an ice cream scoop and freeze. You want the nutella scoops to get very hard so you will be able to handle them easily. Once cooled, scoop the batter onto a foil lined sheet tray and press a nutella ball into the center of the dough. 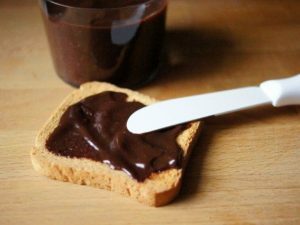 Place another scoop of batter on top of the nutella to seal it in completely. Bake the cookies at 350 ̊ F for 12-15 minutes or until the center no longer looks gooey and wet. Allow to cool and serve!